I participated in my first ever consignment sale last weekend. It was a lot of work. I didn't realize that so much was involved. And I had a lot of stuff to put in it. 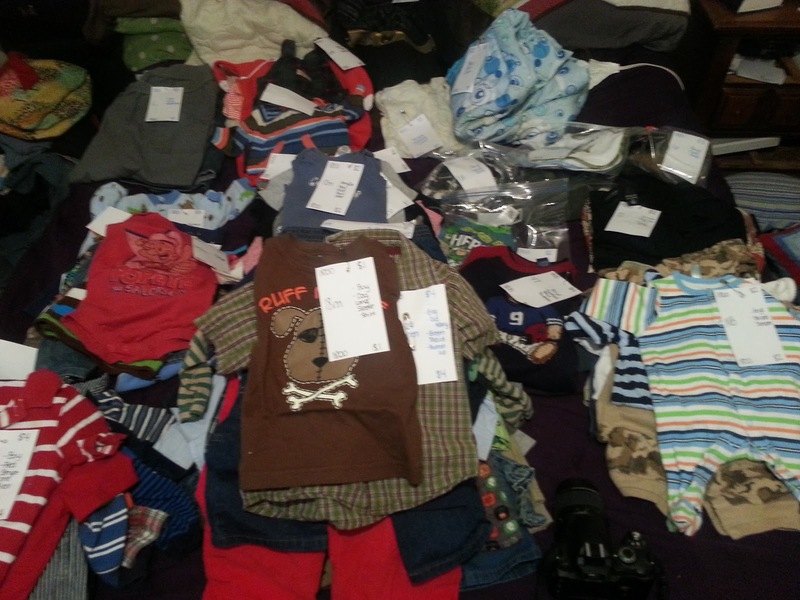 Basically everything in our house that was in decent condition under a size 24 month went in. Along with a formal, a bumper, a carseat, a boppy, and a diaper bag. I had to find all the boxes this stuff was in. I had to wash it. I had to hang it (thank goodness for friends with wire hangers headed to the trash). I had to tag it. And then I had to take it up there. I volunteered to help set up the day before and to help clean up the day of. So I was very involved in this sale. And believe me I will be consigning again. I didn't sale everything nor did I make what I needed to make out of all the clothes but I still made money. And then I put it all on Facebook for sale as well. So now I am just waiting. I will at some point in the next week pack everything back up but leave it easily accessible if it does sale off of Facebook, already tagged and on a hanger for the next consignment sale in August. Here are some pictures. Consigning is a great way to clean out closets and storage buildings. Especially when you know for 100% certain that you are done having children. It will give you a lot of space if it sales and if not unless you really need the money you can always donate it to the Salvation Army. I fully plan on trying to sale all of mine because I want to go to Allume this October but whatever does not sale goes into our next consignment sale in August. And after that I will probably donate the rest to the Salvation Army. Do you consign a lot or do yard sales? Any tips? Mommy Friends? Um Where Do You Find Those?